Pope Francis embraces Argentine Rabbi Abraham Skorka after praying at the Western Wall in Jerusalem in 2014. Looking on is Omar Abboud, Muslim leader from Argentina. CNEWA works on behalf of the Holy Father to help build bridges and heal wounds of division. You don’t need a post-graduate degree to notice our world right now is torn apart — and hatred and division are a big part of it. Whether it’s violence in Pittsburgh or vandalism in the Holy Land or threats of military action against migrants, we find ourselves living in a world increasingly on edge — wary, angry, suspicious of anyone considered to be “The Other.” Whether they are Muslims fleeing war or Jews trying to worship in peace, they too often find themselves to be targets of brutality and hate. And in this troubled world stands CNEWA. One of the things that has struck me during my time with CNEWA is how faithfully, even courageously, this association has worked not only to build bridges with those of other faiths and traditions, but to try and heal the wounds brought about by hate, war and persecution. It is intrinsic to who we are. From our earliest days, Catholic Near East Welfare Association has worked to “create and sustain a friendly interest in the religious and moral life” of those we serve — and to promote unity. 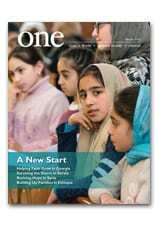 It is written into the name of our magazine, ONE, seeking to create a sense of unity with those who also dwell in our broken world. More than that, we have also enthusiastically engaged in dialogue with “The Other” — whoever that may be. While we always work through the local church, the local church reaches out to the many, Christian or not. But this is who we are. We see in the faces of those who are poor, abandoned, hungry and rejected the face of Christ. We see in them fellow children of Abraham, our brothers and sisters made in the image of God. This is who we are. This is part of our mandate and mission. We are the ones who journey with those who have been brutalized, victimized, neglected, persecuted. As I read the stories of all the troubles afflicting our world right now — and they fill the headlines again and again and again — I take solace and hope from the work CNEWA is doing. Work of healing. Work of hope. It is a commandment that is so often lost in our world right now. It shouldn’t be. We need to reclaim it, and proclaim it. It is so essential to the times in which we live. And CNEWA is a vital part of that. This is a subtle but enduring part of who we are and how we work — an urgent reminder to a dispirited, broken and downcast world that dialogue is possible, that hope endures, that love can transcend hate. What a privilege to know that, to speak that, to believe that, and to be a part of that. Indian homeless children watch a movie on a cellphone on the roadside in Mumbai, India. The final document from the recent Synod of Bishops on young people, the faith and vocational discernment called for the church to meet young people in the digital sphere. Bishop Theodore Mascarenhas spoke to an interfaith gathering in New Delhi last week and called for unity as a way to end religious violence in India (photo: AsiaNews). CNEWA’s regional director in Addis Ababa, Argaw Fantu, forwarded us a report from the Shashemene School for the Blind in Ethiopia — a CNEWA-supported facility that is working wonders with young people. Entrusting ourselves in the hands of God, we began the new scholastic year (2017-18). In spite of the political disturbances, we carried on our good work. Regular and fulltime teaching started by the end of September, as it took time to reach all our students, perhaps because of the political unrest throughout the country. This year the teachers had the opportunity to attend a workshop held in our Catholic mission school. Though it was difficult for only two sisters to see to the running of the residential school—with the political unrest every now and then and other problems—nevertheless, with God’s grace, everything became possible. May God bless those we are privileged to serve! As soon as all the children arrived we had an opening ceremony with the Holy Eucharist. Abba Tesfaye, our parish priest, offered the Mass, invoking God’s blessing on the school. This was followed by Bunna (coffee) ceremony. We were happy to have the visit of our Bishop Abraham Desta along with Abba Gobezayehu, Abba Tesfaye and some visitors from abroad. They took time to go around the school and interact with the children. At the end, we met together to share some concerns of the school. There were several visitors during the year — students from different universities and friends. All expressed appreciation for the work being done. Ex-students: Most of our former students are well-settled in life. One of our ex-students who is married and is working for a government organization was happy to give a talk to the students on causes and prevention of HIV. Another two students doing their research on the foundation and development of the school had a lot to share as a part of their research. It was also a joy to meet five of our ex-students from Hawassa Universitym, who visited the school along with their colleagues. These five have completed their graduation this year and hope to be employed in the near future. Volunteers: We thank a couple from Poland who occasionally gave their services by teaching the children music. They also gave a short training to the teachers on how to operate the braille printer. Another group of youngsters from Shashemane spent time with the children every Saturday. They taught them hymns and games. Christmas Celebrations: This year, the celebrations, were extra colorful with a beautiful decorated tent. New dance costumes added flavor to the show. Many friends, some ex-students, and relatives of children who are not too far away attended. Our children are always happy and excited when they get an occasion to exhibit their talents such as acting, music, dance, acrobatics, reciting poems,etc. Thanks to the efforts of the music teacher, some of the boys were able to handle the key board and perform well, to the delight of the audience. Day of the Differently Abled: This is what the children are — talented and intelligent. On this special day, we created an atmosphere to make them feel that they are indeed able and not disabled. Through a short program, they showed that they are gifted and on a par with any sighted person. Maintenance: The school is 37-years-old. No doubt the buildings and furniture need maintenance and replacements. With the help of our benefactors, we were able to purchase some furniture, water tanks, mattresses, blankets, two sets of sweaters and other necessary items. A lot of maintenance was also done. Here I need to mention Luigi, a volunteer from Italy, who worked hard to get our electrical system in order. We look forward to re-arranging our water system by replacing the old rusted iron pipes with fiber pipes. We hope this will solve our perennial water shortage problem. Tree Planting: Bunna (coffee) is the specialty of Ethiopia. Our teachers were very eager to plant coffee saplings in our school garden. They continue to water and nurture their respective coffee plants. All praise to you, God, for our beautiful green garden! Outings: What a joy to go out for a picnic! We went often with our children to a beautiful park. They looked extra-smart this year in their new school T- Shirts, which had this printed on the front: “Disability is Not Inability.” May they continue to enjoy their childhood and their dignity. Our staff too had a great day at Hawassa Lake. IThey cooked their lunch and had a sumptuous meal. All felt a bond of togetherness as they sang, ate and had a boat ride together. Let us keep up the joy of togetherness! Graduation: This year, we bade farewell to 12 students who completed their elementary education in the residential setting. On the day of their farewell, for the first time, to the amazement of the parents and staff our 12 children dressed in blue graduation gowns and walked elegantly in the midst of the audience. All were filled with joy to see these students in their new attire. All the best, dear students, God bless you! For the first time, students donned gowns for their graduation. A Word of Thanks: We — the students, staff and sisters — owe a deep debt of gratitude to our many kind and generous benefactors, both individuals and groups, without whom our work would not have been possible. My heart-felt thanks to all those who helped us economically and morally, encouraging and strengthening us during the past year. CNEWA remains grateful to all who have helped so many of the young people at Shashemane — truly bringing light to their darkness. What a difference you are making in so many lives. On behalf of all of them, and the people who serve them in Ethiopia, we can only echo this heartfelt sentiment from Sister Ashrita: "Thank you! May God bless you!" A group of Sikhs gathers for a candlelight vigil in the Queens borough of New York on 29 October to pray for the victims of the mass shooting at the Tree of Life Synagogue in Pittsburgh.